PT Aneka Tambang (Persero) Tbk – ANTAM (IDX:ANTM, ASX:ATM) is a reputable Indonesian state-owned mining company. ANTAM has its business activities focused in integrated mining industry with main commodities are gold, silver, nickel, coal, alumina, and precious metals processing. ANTAM also running business in refinery services. As a state-owned company, ANTAM is majority owned by the Government of Indonesia. At present, the shareholders compositions of ANTAM are the Government of Indonesia (65%) and public (35%). ANTAM was established in 1968 as a merger results of several mining companies. ANTAM is based in Jakarta and now operates 9 directly-owned subsidiaries, 12 indirect subsidiary companies, and 5 associates and joint venture companies. 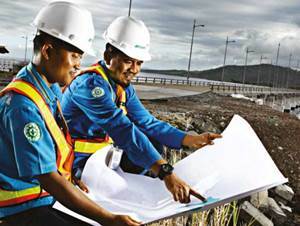 According to PT Aneka Tambang (Persero) Tbk Annual Report 2015 as cited by JobsCDC.com, the Company posted an increase of 10% in total net sales from Rp 9,420.63 billion in the full year of 2014 to Rp 10,531.50 billion in the full year of 2015. ANTAM’s gross profit was down 75.40% at Rp 195.14 billion from Rp 793.36 billion in 2014.